Stuff for sale in North Park becomes art on display in North Park; fall arts previews commence, babies in breweries and more in our weekly digest of arts and culture news. Over a dozen new murals went up on walls across the San Diego region in the last week. Here’s a map of all the new art. The murals (a few still in progress) are by local and international artists rounded up by the PangeaSeed Foundation, a nonprofit that uses art to promote environmental awareness. The org’s ongoing Sea Walls: Murals for Oceans project travels across the world, leaving dozens of new sea-themed murals in its wake. For the San Diego Sea Walls event, PangeaSeed partnered with local arts group the Cohort Collective, environmental nonprofit Surfrider Foundation and the Kaaboo Del Mar music festival happening this weekend. 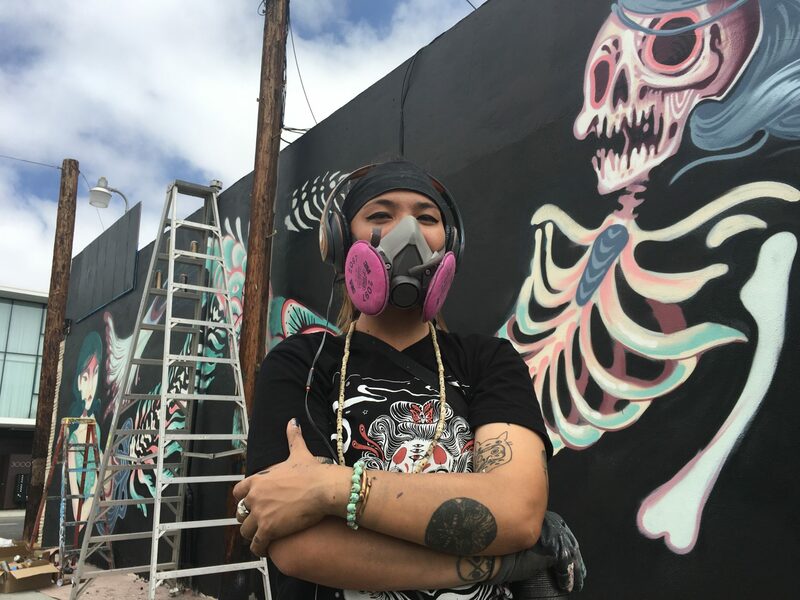 I stopped by a mural going up in North Park and talked to the self-described “gypsy street artist” who goes by the pseudonym Lauren YS. Lauren YS was finishing up details of her mural on Cardamom Café near the corner of Upas and 30th streets. Her piece depicts two mermaids, both halfway deteriorated and turning into skeletons. Netherlands-based street artist I Am Eelco said his mural on the backside of Adrenaline Lacrosse at 24 21st St. in Sherman Heights is more about evoking the feeling of what it’s like to snorkel and look in on the ocean life below. He said he wanted to put sea animals on a pedestal and remind people of their importance rather than hitting folks over the head with a statement about environmentalism. PangeaSeed Foundation doesn’t pay the artists for their murals; instead it covers the cost of painting supplies and offers a stipend to help with traveling and accommodations. That approach makes some art-world insiders uncomfortable and brings up arguments that artists should never be asked to work for free. The project also doesn’t account for the upkeep and maintenance of the murals. That means business owners who’ve agreed to host the work on their walls are responsible for the work. But the speedy nimbleness of the Sea Walls project makes city and county-sanctioned murals look almost pathetically costly and slow. Remember the Martin Luther King Junior mural on a wall on the side of State Route 94 that took the city of San Diego years to complete and cost around $300,000? 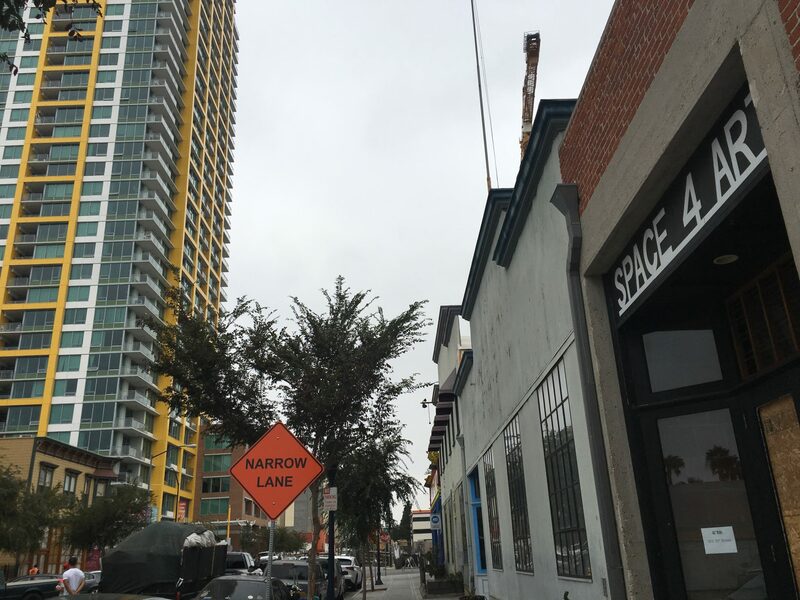 When the Sea Walls festival came to San Diego back in 2014, organizers fell far short of their goal of adding 15 new murals to the urban landscape — it ended with just five new works of art, mostly centered in East Village. Konecki told DiscoverSD that he wanted to make up for that snafu. “We wanted to do San Diego right this time, drum up awareness and have a full activation,” he said. They don’t. And when they do, I pay attention. Last week, Gail Goldman, a public art planning and policy consultant who’s worked with both the city and county, emailed me about “Work Won’t Kill You,” an exhibition by San Antonio-based artist Patty Ortiz on view at Art Produce (the show was recently extended through Sept. 18). She raved about the work. Here’s the gist of the show: Ortiz hired local workers to help her create the exhibition over the last few weeks. 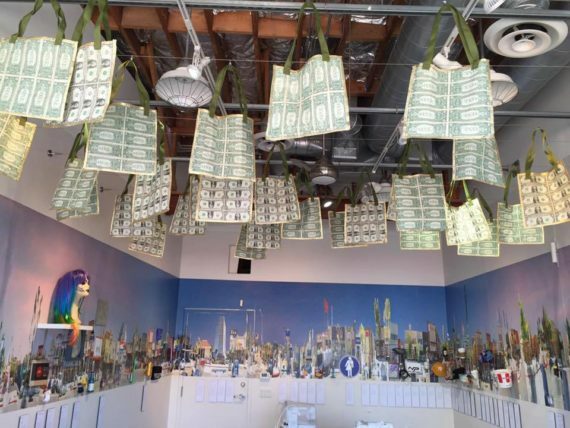 The workers sold shopping bags to gallery visitors with the understanding that the proceeds would go toward buying objects from nearby businesses on University Avenue. The objects, which are supposed to represent the businesses in some way, are then cataloged, labeled and put on display. Everything from T-shirts to wigs, mufflers and condoms now fill the gallery at Art Produce. The end result, Goldman said, is an “amazing, inventive and unique project” that turns everyday objects into North Park iconography and engages the community in the art-making process. • If there’s one good link that will get you to all of the U-T’s fall arts preview stories, I don’t know about it. So click here and look for the fall arts features scattered throughout the page. • East Village, once a haven for artists and galleries, is losing its last major arts venue. Cranes are popping up everywhere in the rapidly gentrifying neighborhood and I’d like to keep my eye on all the changes happening there. Got any arts or culture-related story tips? Send me an email. • The Chula Vista City Council was originally scheduled to vote on the new public art program I told you about at the end of July. It ended up pushing that vote back to tonight at 5 p.m. The plan lays out a framework for making arts and culture more of a city priority. • Here’s a video of San Diego artist Bob Matheny purportedly burying a real a Willem de Kooning painting last Saturday night at Bread & Salt. 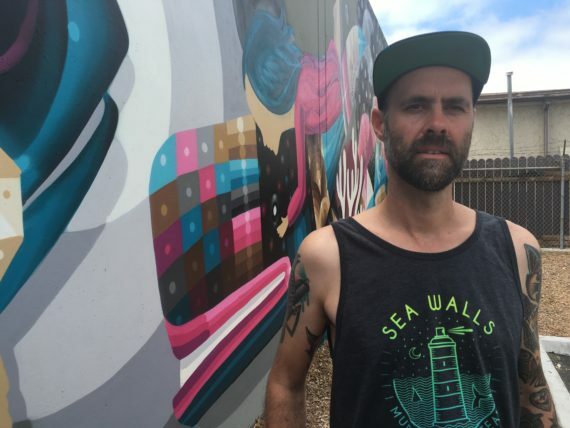 • Hold on to your wallets, this week I came across a local documentary project, a web TV series featuring a San Diego environmentalist and a local mural project all in need of some cash. • Here’s the story behind a new Normal Heights mural. • This video of a live performance of San Diego artist Randall Christopher’s new animated film at a bookstore in North Park is worth watching. • Netflix’s wildy popular “Stranger Things” has inspired artists to make art based on the show.